A: Unlike the standard ladder & squeegee method, the water-fed pole allows the cleaning team to reach panes from the comfort of the ground. The expandable rod is 22 metres high and can easily reach even smudges on the fourth storey of your property. 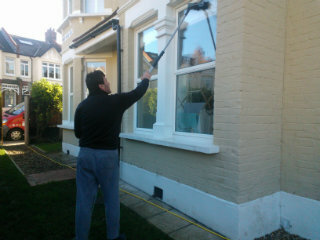 Q: What other washing alternatives are are part of window cleaning Hammersmith and Fulham? A: Besides providing diligent exterior window cleaning, the certified technicians can also ascend and wash any commercial multistorey building – a service named rope access window cleaning. Finally, the cleaning experts can also take care of stains found on the interior side of your panes, and will use ladders and sponges to access distant corners. A: Our water has been purified from all naturally contained limescale deposits. As a result, it will efficiently absorb all splodges on its path and will evaporate under the sun without leaving dregs of its own. Q: Does your service include treatment of business properties? A: Yes, the Hammersmith and Fulham window cleaners will come with the latest cleaning gear to rinse business buildings both small and elevated. The pros can also conduct additional washing tasks, for instance patio washing and gutter cleaning. A: Naturally. The team's water-fed pole is attached to a special filtered water tank inside the cleaning vehicle. In case the fluid has been used up, the specialists will kindly ask you to offer them with any internal or exterior water source. With the intuitive water-fed rod gear, the specialists can help you outclass your competition at modest prices. And you can lower our window cleaning Hammersmith and Fulham rates even further by combining two or more of our cleaning services together! To find out the exact numbers behind our price offers, make sure to browse our handy price table below. Regardless of where your smudges have taken refuge, our capable window cleaning in Hammersmith and Fulham will eliminate them with ease. We have encompassed various washing methods. Our external window clean is aimed at buildings with no more than four storeys. To let the sunshine back inside, the window cleaners in Hammersmith and Fulham will come in a caravan, supplied with an extendible water-fed pole. This system is attached to a water storage, filled with purified water. After being ejected as a powerful gush from the pole's brush-head attachment, the water will absorb all blemishes in an attempt to renew its natural structure. To get to dusty window corners of multistorey properties, we'll send an established team for rope access window cleaning. These certified abseilers will employ well-maintained ropes and harnesses or position ladders and cherry pickers to bring back the allure of your panes. We've got all essential COSHH records in place and follow every safety requirement. To make the in-house surface of your window façade just as shiny, the pros will utilize the usual ladder and squeegee cleaning approach. Do any of your relatives need help with blasting away persistent window streaks? Continue reading to learn which regions the Hammersmith and Fulham window cleaners can visit. Another quick and easy way to get a free instant quote or to book window cleaning services Hammersmith and Fulham W is through our web site.